This photo was taken in natural sunlight in a shaded corner of the garden. The spot was carefully chosen for it's beautiful rich colours that in turn would be used to create an amazing bokeh effect. As I had decided not to use my tripod I needed to find a branch from which I could successfully hand the pendant. The garden was particulalry windy that day so I had to wait until the necklace settled after each gust of wind. I remember that it was a mid Summer's morning and the light was particulalry beautiful that day. The time was probably about 9.30am. The sun was only just starting to creep above the line of the house, but it was just right to illuminate the pendant. My key aim with this shot was to ensure that the pendant was the pure focus of the picture. For this reason I chose natural light and I deliberately used the subtle tones of the foliage behind to create some beautiful Bokeh. I wanted just enough colour to make the image interesting but without drawing the eye from the main subject which was the pendant. A Nikon D5300 with a 55mm-200mm lens at aperture 5.6 was used to capture this image. No flash or tripod was used but the necklace was hung from a branch in order to keep it stable. The light was bright so on this occassion a trpod wasn't needed and as I was constantly shooting different angles I had to be qute agile. I needed to photograph the Onxy Pendant for the www.onlyhere.co.uk website which prides itself on teaming up beautiful products with beautiful photography in order showcase everything to the max. I felt really inspired by the Onyx pendant especially because of the way in which it's central onxy stone really captured the light. I knew from experience that such a pretty item really needed the perfect background and becuase the stone is made in nature, it seemed fitting to photograph it in a natural setting. 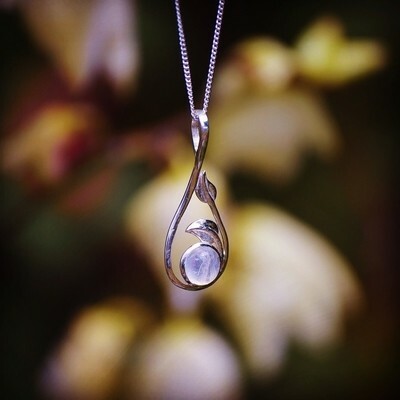 I also felt that I wanted the end result to be a work of art in itself, so for me photographing the pendant was about creating not only a prduct shot but also a beautiful and timeless image. I hope that I have achieved this as this was the inspiration behind the picture. Believe it or not there was actually very little post processing in this shot apart from the very basic edits, which included a small amount of sharpening and slight contrast adjustment. I am a great Nikon fan and I always have my Nikon D5300 with me. I also always carry my 18mm-55mm lens along with my 55mm-200mm telephoto lens. The latter is a great lens for producing Bokeh. I'm also never without my polarising filter and I carry a wide variety of ND filters. As I'm a fan of infrared, you will always find my Hoya R72 in there as well. I have a Nikon SB910 which often comes along as I find it great for remote off camera flash. When trying to capture a neckalce in natural light outside, one of the biggest challenges is keeping the necklace stable expecially if it is particulalry windy. I would recommend choosing a sheltered spot or a very calm day. It is also useful to have something to hang your jewellery from. I was lucky as I was able to use the foliage benind, but in case there aren't any branches you may wish to have someone to hold the item or have something to hang it from. The mornnig sunshine is particulalry beautiful and a good time to shoot. Have the widest aperture that you can as this helps in blurring your background. Also choose your background colours well as this can really make or break the shot.